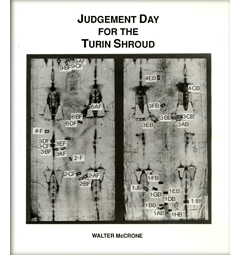 Judgement Day for the Turin Shroud is a story of faith vs. science as told by a scientist who spent many months, over nearly 20 years, working on the Shroud and who concluded the Shroud is an inspired medieval painting. A scientist trained in chemistry, micro-analysis, materials analysis, painting authentication, and chemical microscopy. A scientist with 62 years of research, basic and applied, on problem solving with the microscope. A scientist who has written 350 scientific papers, 12 books, and an equal number of encyclopedia articles and book chapters in edited scientific works. A scientist who has studied the authentication of more than 100 paintings, paintings attributed to Leonardo, Raphael, Giorgione, Correggio, Rembrandt, Constable, Turner, Manet, Van Gogh, Picasso, Monet, Lissitski, Larionov, Kandinsky, Homer, Warhol, etc., as well as Persian burial silks, Mayan pottery, several maps and documents such as Columbus’ letters to Queen Isabella and the Vinland Map. He is a scientist who started four companies here and in England; two to work on analytical problems for government and industry and two to teach courses on the techniques he uses to solve tough and important problems. These companies today teach 1,000 students a year in nearly 100 different courses all based on microscopy and ultra-microanalysis.